Magnets allow for the easy closure of, e.g. breast pockets or for retaining screws and bits in hanging pockets. People with pacemakers or an ICD should not use products fitted with magnets. Magnetically sensitive items should also be kept well away from magnets. Breathable, wind and waterproof MASCOTEX® with taped seams. Internal quilted jacket has ribbed collar and pockets and can be zipped out and used separately. Individual sizing through adjustable bottom edge. Canvas structure.Do not use fabric softner. 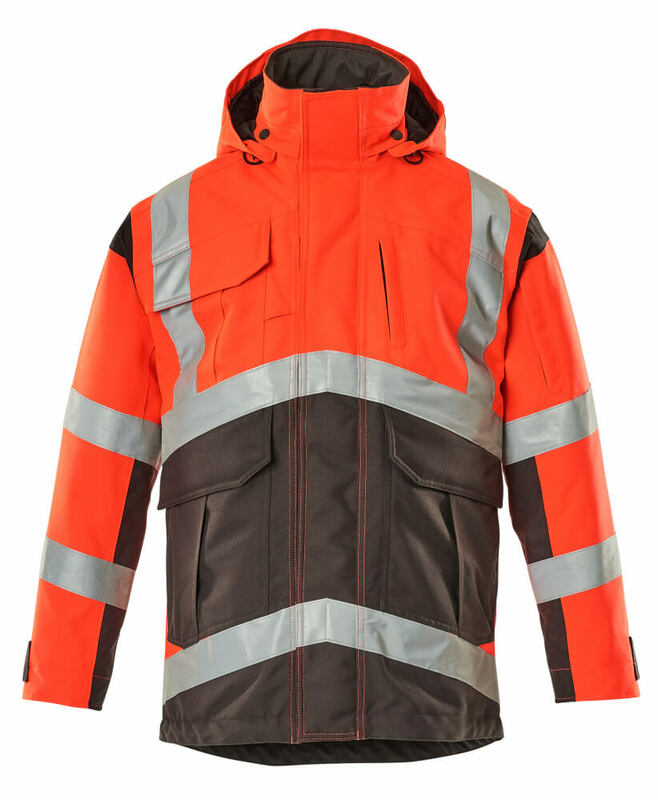 On days with heavy rain you need workwear made from MASCOTEX®. MASCOTEX® is a fabric with a breathable laminate on the back that makes the material waterproof. It is certified to EN 343, the European norm for protection against rain. When MASCOT® makes workwear in MASCOTEX®, all seams are taped so your MASCOTEX® product is 100% waterproof. It is also breathable so you can work comfortably at a fast pace. Fluorescent and with vertical and chevroned crossed reflective strips. Two-toned. Breathable, wind and waterproof. Taped seams. Detachable lined hood with adjustable drawstring. Quilt lining can zip out and be used separately - has ribbed collar and pockets. Inner collar of soft, durable material. Fastening with two way zip, double storm flap and hidden press studs. Zipped pockets under storm flap. Chest pocket with zip. Chest pocket with flap and magnetic fastening. D-ring. Pen holder. Front pockets - two open and two with flap and press stud. Inner pocket with zip. Ergonomically shaped sleeves allows high freedom of movement. Zipped sleeve pocket. Rib (hidden in storm flap) and press stud fastening at cuffs. Adjustable elastic drawstring at waist. Products with magnets must not be used by people with pacemakers/ICD or similar devices due to the risk of a magnetic reaction caused where the magnets are placed. High-visibility warning clothing for professional use X: Indicates product’s overall class, depending on the area of the fluorescent fabric and the area of reflective tape. The product is certified with maximum 0,2200m² logo area. This approved area must not be exceeded. Logo on, respectively, front or back of the product can constitute only a maximum of 50% of the total approved logo area in order to maintain the EN ISO 20471-certification.